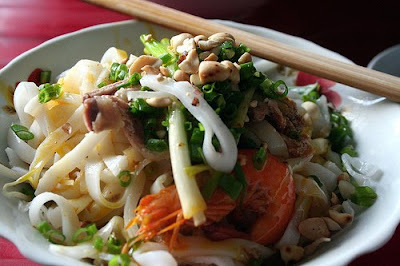 There are many Quang noodle restaurants in Quang Nam and Da Nang. Each area is famous for one certain recipe. 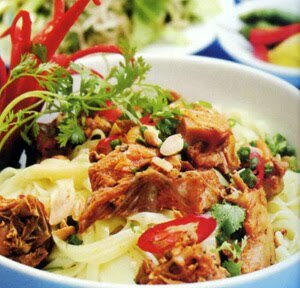 For example, Thanh Chiem Village in Dien Ban District, Quang Nam Province is known for shrimp noodle, while chicken noodle is at its best in Tuy Loan, Hoa Vang District, Da Nang City. A traditional version says: “I make for you, darling, green tea and Quang noodles to express my feelings”. Thus, you can visit a Quang noodle kiosk in Danang City to enjoy the typical flavor of the soups, for instance: Ngan Quang Noodle at 108 Dong Da Street, Lu Quang Noodle at Ham Nghi Street, Vi Quang Noodle at 155 Trung Nu Vuong Street and so on. Heat a tablespoon of cooking oil in a skillet. Add annatto seeds and stir-fry over low heat to lose their color. Discard the seeds. Set annatto oil aside in a bowl. Add 2 tablespoons of cooking oil, shallots and garlic to the skillet and fry. Add pork, stir-fry for about 3 minutes. Season with 2 teaspoons of stock granules, a teaspoon of fish sauce, a teaspoon of sugar, a pinch of turmeric powder. Add shrimps to stir-fry togather. Add ½ cup of broth to the skillet. Simmer for about 20 minutes. Mix well and season again to have a pleasant taste. Add annatto oil and ½ teaspoon of pepper. Heat a pot with broth. Bring to a boil, season again and keep it hot on the cooker. Scald Quang noodles in boiling water. If using dried flat rice noodles, soak in hot water for 5 minutes, then scald in boiling water for 2-3 minutes until just soft. Take out and drain noodles, mix with a tablespoon of cooking oil to prevent the noodles from sticking together. Grill sesame rice paper wrappers until yellow. Add noodles (of flat rice noodles) to a bowl. Arrange sausages, pork, shrimps over. Sprinkle with a little sauce from the skillet with shrimps. Then, add hot broth to wet noodles. Sprinkle with roasted peanuts and saw-leaf herbs on top. 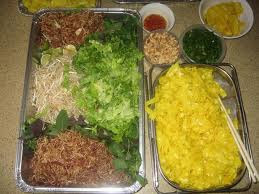 Serve with grilled rice paper wrappers, a dish of mixed vegetables, lime and small green chilies. Notice: Quang noodles is eaten in a dryness style, which means noodles is only wetted with broth and do not pour too much broth like pho or hutieu. To have a good taste, Quang noodles must be eaten with a lot of vegetables. 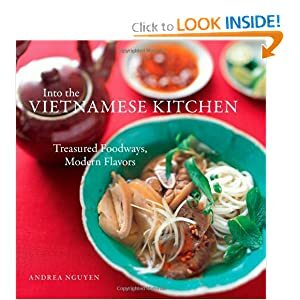 You can add crab meat, chicken breast meat, fish ballds, chicken eggs or thinly sliced squids to have a more attactive and plentiful bowl of Quang noodles.